This post is part of our series on Weird Jobs. Check out the other articles to learn about more weird jobs you could try! Halloween may come once a year for most of us; however, for mask makers, Halloween is a year-round business. Finely-crafted, full-head-coverage latex masks can earn their creators $60-$400 a pop,depending on their artistic skill and selling abilities. Admittedly, the highest-earning mask makers base their creations on pre-existing properties — an elaborate form of fan art — but licensing and copyright issues can be tricky, especially for beginners. Luckily, artists with original creations have the potential to earn a pretty penny in this field as well. One such artist is Illinois-based Aaron Lewis, an accomplished sculptor who has been earning a living with his original mask designs for the past five years. Creativity and artistic skill are must-haves. However, a college art degree isn’t necessary. “I draw/design, sculpt, mold, pour and paint latex rubber Halloween masks. [But], other than the usual high school art classes, I have no formal training,” explains Lewis. Most mask makers work as freelancers, meaning the creation and selling of Halloween masks is in their own hands. In other words, how much you earn is completely up to you. Of course, to earn any money, you first need to learn how to create the product. Are you ready? Step 1: Sculpt a mask on a plaster bust using soft water-based or oil-based clay. Lewis uses EM-217 (WED) Clay, a slow-drying water-based clay. Step 2: Spray your finished sculpture with Crystal Clear Krylon. Then build a wall or dam around your sculpture using water-based clay, running it along where the seam-line will be. Step 3: Mix up some plaster and apply it to one side of your sculpture. After it dries, remove the wall or dam and put Vaseline on the surface edge of the plaster so the two halves of your mold won’t stick to each other. Then mix up some more plaster and create the other half of your mold following the same procedure. Step 4: Remove the mold from your clay sculpture after the plaster is completely dry and wait a few days before using it. “No dulling spray or mold release [needed],” says Lewis. Step 5: Pour a couple of gallons of liquid latex into your mold, filling it completely. Wait a couple hours, then dump the excess latex back out, leaving only what clings to the sides. Allow it to dry for approximately 24 hours and then pull your mask out! Note: Recommended places to get liquid latex are Burman Industries and Silpak, Inc. — both companies sell their products nationwide in the United States. (If you live elsewhere, try Googling “liquid latex” for other reliable vendors). Step 6: Trim out eyes, ears and nostril holes from your latex mask. Also remove flashing (excess latex along the seam-line) and patch any holes where the latex is thin or missing. Paint it, and add hair if desired. Step 7: Sell your mask. 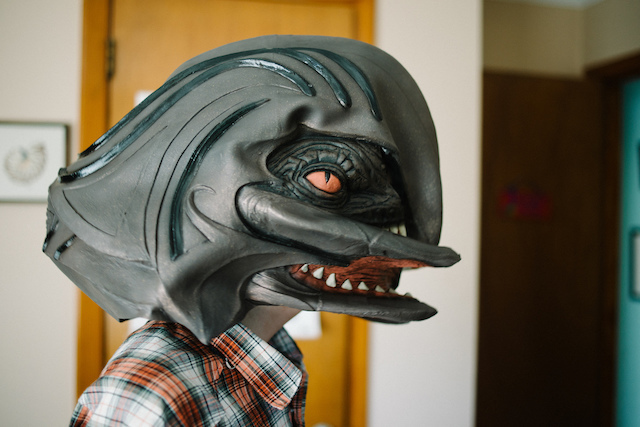 Your Turn: Would you like to make a living creating wearable monster masks? Lauren Tharp is a freelance writer and the owner of LittleZotz Writing. Through her website, Lauren helps small businesses bring their brands to life through written content; and she also helps fellow writers get started as freelancers via weekly blog posts, bi-monthly newsletters, free e-books, and one-on-one mentoring.